Love an individual look and want to further optimize the race feel of your new BMW 5 Series? Choose BMW M Performance Parts! The result of years of BMW motor racing know-how, BMW M Performance Parts have been closely developed with BMW M GmbH. Each component goes through an intense development and manufacturing process. So uncompromising sportiness is consistently realized every time. Shop our full line of Genuine BMW M Performance Parts for the G30 5 Series! 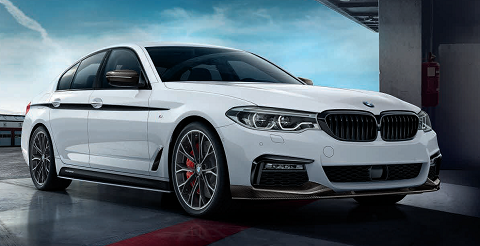 From black grilles, wheel sets, and spoilers, to BMW big brake kits, carbon fiber components, power kits and exhaust systems - we offer the M Performance parts your BMW 5 Series craves! Our huge BMW parts inventory means low pricing, fast order processing, and lightning quick shipping on all Genuine OEM BMW M Performance parts and accessories! Looking for other G30 5 Series BMW Accessories? Shop those here!